Description Printed in colour. Size 39cm x 33cm (15" x 13"). 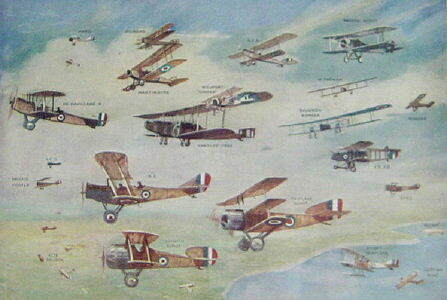 Planes depicted are Sopwith Scout, Short Seaplane, Curtiss Boat, Triplane Scout, Spad, F.E.2D, B.E, S.E.5, Bristol Fighter, De Havilland 4, Handley-Page, Caudron Bomber, Morane, M Farman, Nieuport "Chaser", Martinsyde, Avro, Vickers, R.E.8 & Bristol Scout plus a Kite Balloon & Blimp.